Unlike other cervical traction devices, which may rely on water bags or heavy weights to create the therapeutic tension, NeckPro II relies on a simple tension spring to create tension. 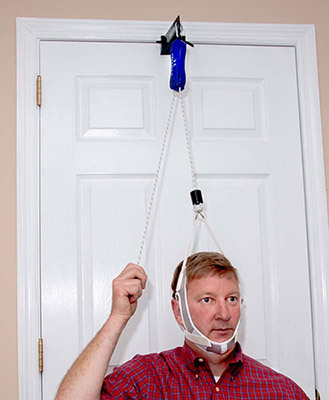 The user simply slips on the head halter and then pulls on the rope to apply tension. Once the rope is taut, each click increases the tension with each pull by approximately one pound. A maximum of approximately 25 pounds of tension is possible. The NeckPro II is simple, easy, effective, portable and affordable and does not require any assembly, making it the most user-friendly cervical traction unit available. As the head and neck are not locked into a single position, the users head can move while using NeckPro II, allowing rotation and extension along with traction to achieve maximum mobility and relaxation. Reducing Neck Pain is as easy as 1, 2, 3! NeckPro II promotes relaxation and thereby reduces stress and tension. In many cases, it can reduce or eliminate the need for costly pain medication because it offers such immediate relief. Most importantly, NeckPro II can restore normal neck mobility, flexibility, and range of motion, which can help postpone or eliminate surgery and which can return the spine to its correct anatomical posture. 1. Attach the adjustable NeckPro II bracket to the top of any door. 2. Sit in a chair with your back against the door. Then slide the head halter over the head, and pull the straps forward and attach to the Velcroå¨ patches on both sides of the chin strap. 3. By pulling on the hand cord, you can adjust the tension to a comfortable level. 4. Simply sit back and let the constant, comfortable tension of the NeckPro II start relieving the pain and stress you have been experiencing. Attention: Use as directed by your licensed medical practitioner to be sure you have no medical or physical condition, which would preclude its use. Use only according to the above instructions. DO NOT modify or disassemble. Keep away from children. DO NOT USE IF… You have severe osteoporosis, cancer of the bone or metastatic cancer, congenital spine deformity, panic disorder, unstable or fracture of upper spine, worsening of your pain or condition, spinal cord injury, fusion of cervical vertebrae, temporomandibular joint disorder, or if your symptoms are in any way related to fever or infection.